NMLS 2.0 is the next generation of NMLS. With NMLS 2.0, state regulators, industry and individual users manage a full range of state licensing and federal registry activities will experience improved access to data, increased uniformity and more automation. The new system will allow state regulators to improve their operations, so they can maintain a strong focus on financial services supervision and enhancing consumer protection. Interested in engaging in the process? Visit the Get Involved page. NMLS 2.0 will leverage external data sources rather than recreating data when applicable. NMLS 2.0 will be built to best practices in data security and privacy protections. NMLS 2.0 is a real time system that will show the current state of an entity's record. NMLS 2.0 will provide an application/licensing platform containing uniform data, terms, and definitions. NMLS 2.0 will present users with only information that is relevant to them based on their role (i.e. regulator, industry type, etc.). The System will enable uniform core policies/processes based on best practices identified through the established governance process. 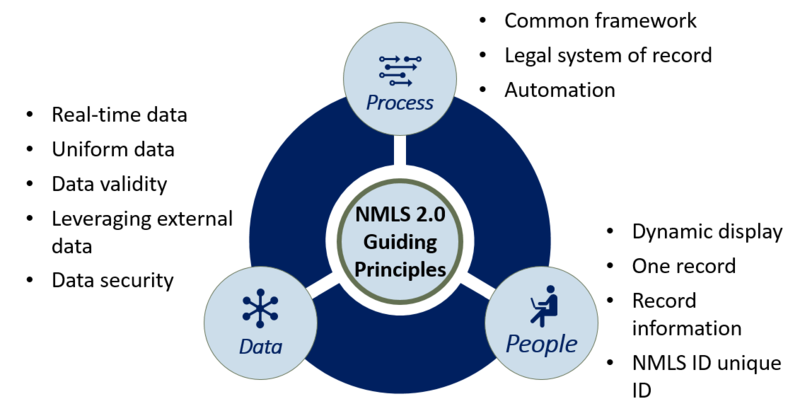 NMLS 2.0 will be built to promote data quality through accurate data input and will validate data where possible. The ability to create or modify record information will be limited to the entity with the right to control it. NMLS is a legal system of record for agencies participating in NMLS. The NMLS Unique ID will be applied to only unique legal entities or a natural person. Manual and routine processes will be automated to the greatest extent possible. Each distinct legal entity, branch, and natural person will have a single, unique record in NMLS. The entity's One Record in NMLS can be used to apply for, maintain, or surrender licenses in multiple states and will capture all data required in the supervision process. 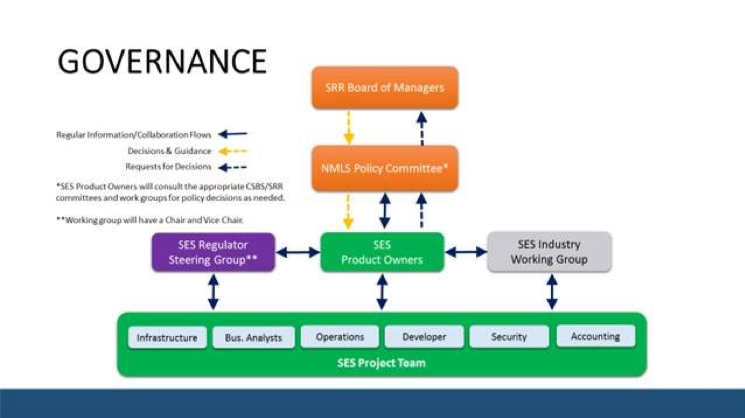 NMLS 2.0 will be a one-stop, streamlined platform for state financial services regulators to manage both licensing and supervision. NMLS 2.0 will transform from a gate-keeping model based on manual review of individual applications to a risk-based model based on data analysis and batch-vetting of new applicants coupled with real-time monitoring of existing licensees. NMLS 2.0 will continue to serve as the nationwide, federal registration platform for mortgage loan originators. Learn more about the vision for NMLS 2.0 and the "Vision 2020" initiative to modernize state supervision here. Be User Driven: Built with intuitive, automated processes with industry and regulatory users in mind. Be Responsive: Display relevant information, compliance items, actionable assignments, and clear communication, based on user role. Provide Accurate Data: Use data analytics where possible to credential, validate and ensure the accuracy of information in the system. Expedite Processing: Automate the identification of compliant candidates through data, analytics and business rules and to identify others quickly and focus detailed review on more complex applicants. Secure Data: Incorporate industry best practices in data security and privacy protection.